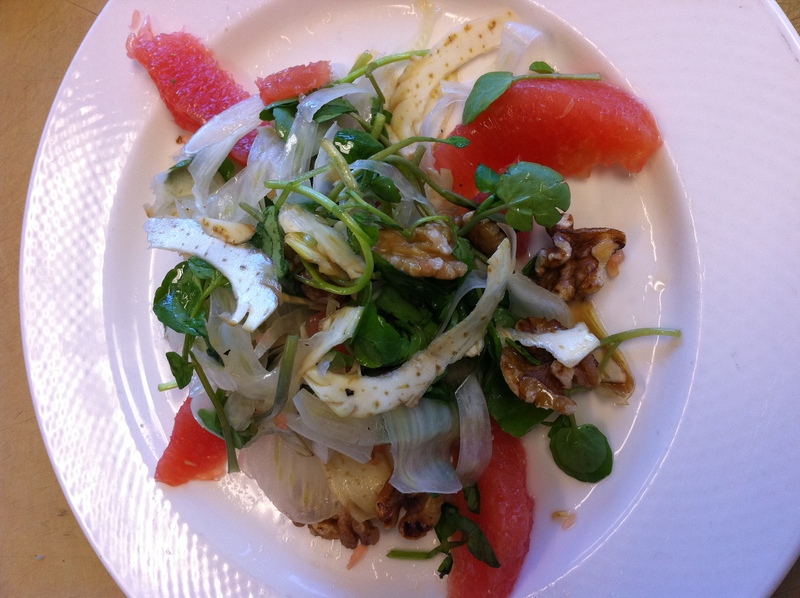 The grapefruit, fennel, artichoke, watercress and walnut salad was delicious. The grapefruit vinaigrette was so nice and light, especially due to the sweetness of the fresh grapefruits we worked with today. Here’s the recipe (it’s really simple): 1-2 Tablespoons walnut oil, 2 Tablespoons extra virgin olive oil, 2 tablespoons fresh grapefruit juice you reserved after cutting your grapefruit into nice slices (supremes), salt, pepper, and a squeeze of fresh lemon juice to brighten it up a bit. You can play with the ratios here, as Bobbie and I did, to our taste. This recipe was also super simple to make. I would have added some spice, such as cayenne, to the falafel mixture before deep frying the balls (yes, deep frying isn’t exactly “nutritious”, but if you use the right oil and don’t fry at too high or too low of a temp, it isn’t all that bad for you once in a while), as I think that’s always a nice kicker inside falafel. Or, on top of the tahini sauce, I would add sriracha – same concept to give it some heat. 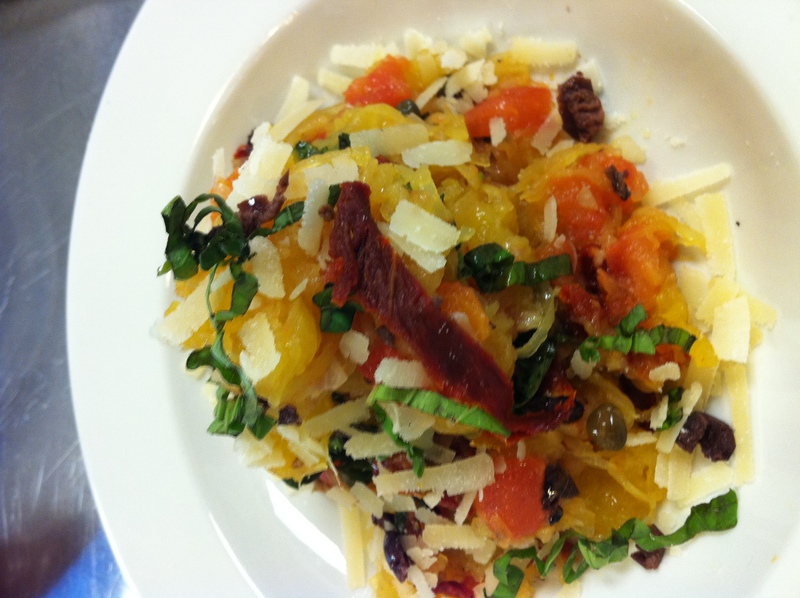 Finally, we made a funky spaghetti squash dish with a puttanesca-esque “sauce.” I’ll be honest, it was just weird. And, I wasn’t the only one who thought so. I was hoping this was going to be a lovely tribute day to vegetarians, but this dish was not very good (and, it wasn’t the execution, as ours tasted like Chef Tomm’s). First of all, the anchovy just didn’t work with the spaghetti squash, on top of the capers, nicoise olives, sundried tomatoes, basil, cheese, and regular tomatoes. I love all of those ingredients, and I love some of them together in other dishes. But, this recipe needs an overhaul and was a weak addition to the homage to vegetables day. FCI, may I be so bold as to suggest you take a look at some of your recipes on the nutrition days? 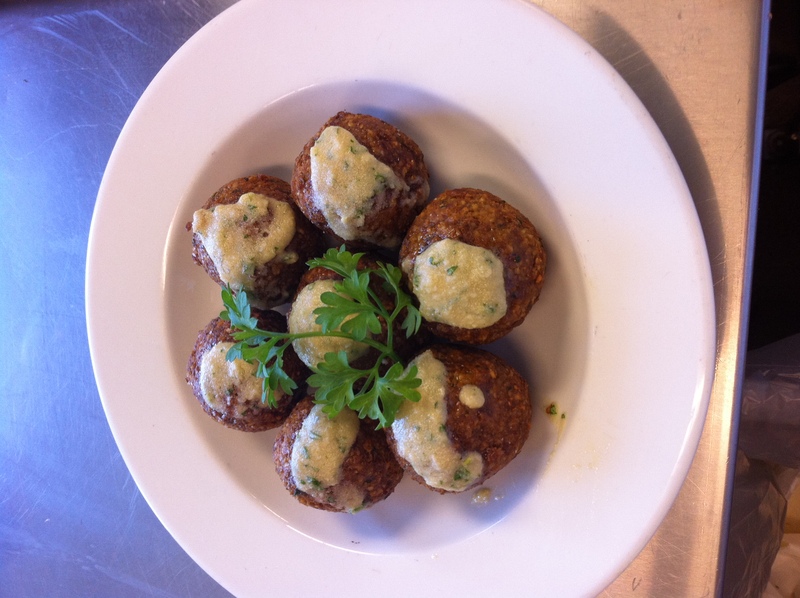 As a former vegetarian, I could give you several different recipes that would be much better tasting; equally, if not more, nutritious; just as easy to prepare as the spaghetti squash and falafel recipes; and that would excite vegetarians or people wanting a vegetarian option. With all of the health conscious people and vegetarians eating out these days, surely the curriculum could use some updating so that soon-to-be-chefs have a better understanding of how to put out exceptional vegetarian and healthy options when a patron asks for one. You have a nutrition expert and amazing chef at school – Chef Tim – and I’m sure he has some fabulous recipes that should be included in the curriculum in the future. I’m looking forward to tomorrow’s “chef’s choice” day. I’m imagining it’s going to be like the t.v. show “Chopped”, where Chef Tomm will give us a few main proteins to work with and then we have access to the pantry to come up with some tasty and beautiful dishes in a certain amount of time. Please, no offal!